A great round to fire when sharpening your skills. Loaded to the same demanding specs as Federal's Premium loads, but you'll find these more affordable to shoot. It's a perfect combination! Federal American Eagle Suppressor, .22LR, CP, 45 Grain, 50 Rounds is rated 3.9 out of 5 by 38. Rated 5 out of 5 by Green Ciscoe from Works great in suppressed AR and Pistol - Nice Price! Have been running this ammo with no flaws in a Tactical Solutions AR-22 and Ruger Mark IV - both suppressed. Very quiet, zero cycling issues. Backyard quiet - what's not to like! Rated 5 out of 5 by SSgtJ from The best, mos 22 rimfire ammo @ a reasonable price I've been shooting this ammo for 30 years and buy it 4000 rounds at a time. Taught my children and grandchildren to shoot with it. Rated 5 out of 5 by jack96 from Big surprise! I bought this amunitoin for my Beretta M71 and it shoots well. No broblems after 40 shots. And its not so expansive. Rated 1 out of 5 by Irish22 from 10 Short I have seen this stuff on the shelves and realized only 40 in a box (400 in a brick). Hoping after some complaints from others over the years they would go back to 50!!! I find myself checking round counts on all boxes now??? I shouldn't have to do this. 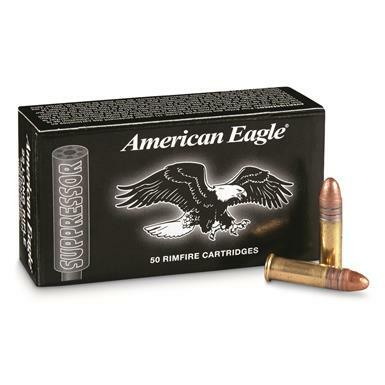 American Eagle (Federal) is good ammo, but until the count goes back to 50, I'm done with this Complete Brand PERIOD!!! 333/222/275/etc. same boat, but 525/555's etc. those are bonus rounds!! Marketing SOMETIMES is a rip off!!! Charge a little more if you must, but make THE COUNT right! Just my 2 CENTS! Rated 1 out of 5 by What gives from Love the ammo, 5 stars, hate the new 40 round box Have always loved the ammo for its cost and accuracy. But why have you gone the way of the ice cream manufacturers, and others, and reduced the size of your product without reducing the price. Now we pay more for less. With ice cream, OK, maybe we should eat less, but for shooting, the more practice the better. I am disappointed Federal made this decision strictly for profits. Next will be 16 round larger caliber boxes! Then you will lose me as a customer. Rated 5 out of 5 by msonelson from Shoots fine from my CZ 455 This ammunition shoots well from my new CZ455 mounted with a Leupold Rimfire VX-1 2x7. I couldn't quite coax a 1/2" inch group at 50 yards but it consistently produced 5/8" to 3/4" groups. Both shooting sessions with the AE 38 HP were on cold and blustery days so I'm thinking I should be able to sharpen up to 1/2" or maybe better on a fair day. But, yeah what's with the 40 round box?